In the past few years, the Southwest region of Georgia has experienced a number of weather-related disasters. To help individuals and families get back on their feet, Inspiritus has assembled a disaster team to work in the region. Inspiritus recently hired Richard Tison as a construction manager to join our current disaster response construction team, who also oversees projects in both the Soutwest and Coastal regions. To provide additional support to families, Inspiritus brought on Sabrina More as Inspiritus’ Disaster Relief Caseworker for the Southwest. Recently Sabrina worked with Sarah Burns*, a 71-year-old disaster survivor and mother of two adult daughters with disabilities. Sarah has cared for her daughters all of their lives and was fearful that they would lose everything due to the challenges they faced following Hurricane Michael. Sarah’s area of town was without power for two weeks after Michael came through Albany. Her vegetable garden supplies most of the food she and her daughters eat. During the storm, she lost much of her garden and the food supply she had stockpiled in the freezer. Money that would typically pay for her mortgage and utilities was spent on groceries. Thankfully, Sarah was able to work out a payment plan with her bank for her home mortgage, and Inspiritus stepped in to help connect her to money for utility bills and a grocery store gift card to help with food. Once Inspiritus was able to remove some of the burden and worry from Sarah, she shared with Sabrina that she finally felt like she could relax. On the construction management side, Inspiritus’ construction managers Al Kates and Richard Tison have been working with Albany residents to restore their homes following the tornadoes of 2017 and will soon start work on homes damaged during Hurricane Michael. Donna and Albert Timmons, members of Lutheran Church of our Savior in Albany, GA, have been living in various temporary housing situations for more than two years after half their home was destroyed in 2017. They were blessed to survive the huge oak tree that crashed through their bedroom, where Donna had been laying just moments earlier. However, their home was uninhabitable. The Timmons quickly learned that many of their neighbors were in similar situations. With the large amount of property damage in the area, the Timmons had a difficult time finding a contractor who was available to do the work. . They finally found a contractor. Following the advice of FEMA they hired a local business, but the Timmons still ran into problems. The contractor they hired disappeared and declared bankruptcy, leaving them without a contractor and dwindling hope. This is when the Inspiritus construction management team stepped in to help. “When we got on the right path, it was a great relief. We finally had someone to show us what to do. We felt we had someone looking after us and that we were going to get some help. It was a blessing,” says Donna. Inspiritus’ Al Kates and Richard Tison worked to find local contractors to complete the projects so the Timmons will get back in their home as soon as possible. 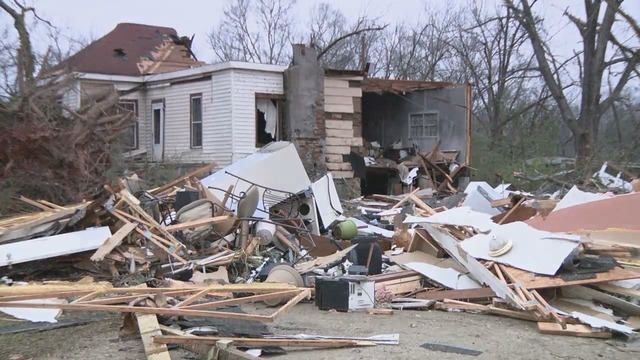 The Inspiritus disaster team has worked with several churches from the metro Atlanta in providing volunteer groups to assist in some of the work. Groups from Good Shepherd Lutheran in Peachtree City and Lutheran Church of the Resurrection, Faith Lutheran Church, Papermill Baptist and Johnson Ferry Baptist in Marietta and Rivercliff Lutheran in Roswell have been a huge help in getting the Timmons closer to moving back home. Inspiritus is in need of donations and volunteer groups to help us continue to restore the lives and homes of these disaster survivors. Donate to Inspiritus’ disaster recovery work to provide support. Select disaster response to direct your funds specifically to our disaster work.